Viola is made from Laura Ashley Upholstry grade fabric in a lovely lavender colour with a sweet floral woven in design. Her front panel is made from lavender linen look upholstery fabric, her wings and back are made from natural coloured fabric with a stripe and small flowers in lavender with a hint of green., greens and a hint of sand. 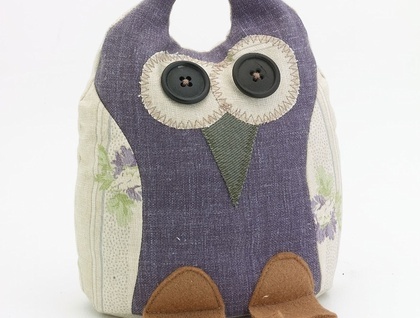 She has an olive beak and sandy feet,Her large eyes are made from fantastic vintage buttons. Whooo loves Viola? Please note they are quiite heavy so if you are wanting one sent internationally it is best to ask me to make one up unfilled for you to fill on arrival.